Luxations of primary teeth are treated by extraction. 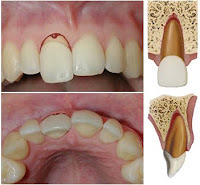 Permanent teeth are immediately treated if malocclusion or significant mobility is present. It consists of repositioning and splinting. Intrusion injuries are generally followed up by a dentist within 48 hours. Permanent teeth will generally re-erupt within 6 weeks. Intrusions <3mm have a good prognosis, those >6mm have a poor outcome secondary to inflammatory root resorption. teeth that have been knocked completely out of the socket. The best storage media in order of preference are milk, saliva, and saline. Hank's Solution (Save-a-Tooth) can preserve the fragile periodontal ligament for 24 hours. the major risk of not preserving a tooth is that it will dry out. Ideal re-implantation with 90% survivability occurs within 90 minutes. Survival decreases 1% every minute thereafter, with very few teeth surviving after being out >2 hours. Primary teeth should never be re-implanted, as there is a risk of interfering with the eruption of a permanent tooth, as well as ankylosis (fusion of the tooth with the alveolar bone) occurring. Go with the advanced option in nobel biocare implants like Fixed teeth in India where the patient’s satisfaction and self confidence is the main motive that provides treatment at the best price.